In our Gospel reading for today, our Lord speaks of John the Baptizer—the forerunner sent to prepare the way of the Lord. 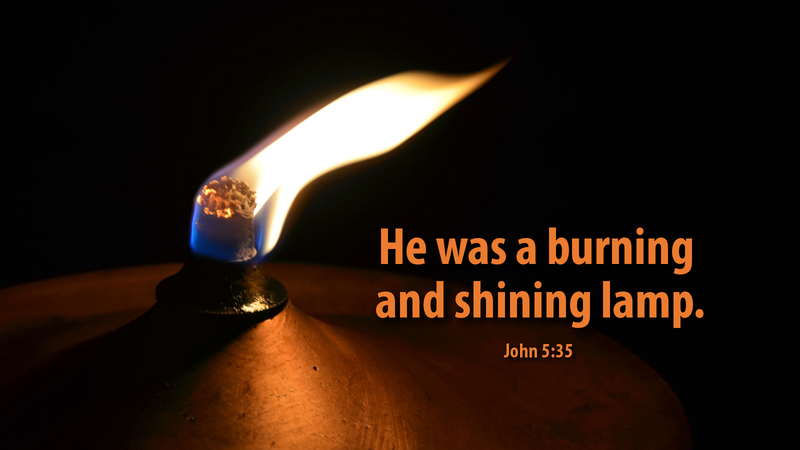 Jesus says that John was truly a burning and shining lamp, which gave people cause to rejoice for a time in his light. But the point is that John’s light was momentary and limited. It burned and shone only for a time, until it was overpowered by the consuming, transforming Light of Christ! We are called to burn and shine, but not in John’s light, and certainly not in our own. We burn and shine, we dance and shout for joy in Jesus’ light, even as He says, “I am the Light of the World!” (John 8:12) He affirms that his testimony is greater than John’s, because the Son was sent by the Father—and the Son’s voice is the voice of the Father. When we see Jesus, we see the Father, by the power of the Holy Spirit. When we bask in the Light of the Son, we are being enlightened by the glory of the Father! As we are now in the darkest days of Advent, let the Light of Christ burn in you richly! The world needs His light, shining through you. We say in the baptismal rite, “Let your light so shine before others, that they may see your good works and give glory to your Father in heaven.” (Matthew 5:16) It is not your light first, but the Light of Christ, reflected in your life! Prayer: Lord Jesus, let your light burn and shine in me, that I may give glory to our Father. Amen. Advent Action: Remember your baptism! Find your baptismal certificate, or ask a family member or call the church where you were baptized, so that knowing the date of your baptism, you can celebrate the day, each year—and celebrate the Light of Christ anew! I have known my baptismal date for most of my life. My mom made sure of that!! February 9, 1947, at 2 months and 1 day. Thank you, mom.